New Virus Related To SARS Detected In The Middle East : Shots - Health News A virus, which is genetically different than any seen before, has killed one man and hospitalized another. 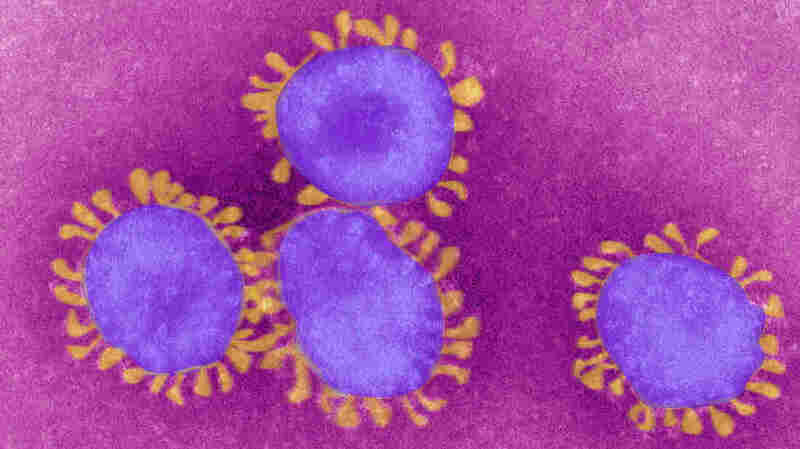 The virus comes from the same family as SARS, but it appears to be less contagious. A mysterious virus has put a Qatari man in critical condition at a U.K. hospital, the World Health Organization said Sunday. His illness is due to a new type of coronavirus, the family of viruses that causes common colds and severe acute respiratory syndrome, or SARS. The virus, which is genetically different than SARS, has been detected once before, when it led to the death of a Saudi Arabian man this summer. In this one and the previous case, the patients' symptoms were similar to those assoicated with SARS — serious respiratory problems with a fever, cough and shortness of breath. Don't panic. While very little is known about the virus so far, what has been figured out suggests that the virus has important differences that make it less of a threat than SARS. For starters, the new virus doesn't seem to be highly contagious. "SARS was very quick off the mark infecting hospital staff," John Oxford, a virologist from the Queen Mary, University of London told Reuters today. "And this new virus does not to me appear to be in the same 'big bang' group." The virus is "more likely to join numerous other members of the coronavirus family and behave like a nasty infection rather than join the exception group like SARS," Oxford told Reuters. No health care workers have gotten sick yet, and the virus doesn't appear to have spread beyond the Middle East, or even Saudi Arabia. The Qatari man had traveled to Saudi Arabia before becoming sick in Qatar. He was then moved to an intensive care unit in London to be treated for kidney failure. There's no evidence that the virus can move between people at all. The WHO is investigating whether animals infected the two patients, the Associated Press reported today. Given the severity of the illness, however, Britian's Health Protection Agency is watching for more cases and taking precautions to prevent it from spreading. "Immediate steps have been taken to ensure that people who have been in contact with the U.K. case have not been infected, and there is no evidence to suggest that they have," John Watson, director of the respiratory diseases department at the HPA, said in a statement yesterday. The agency is also looking at a few other pneumonia-like cases in the Middle East to see if they are linked to these two patients or caused by the new virus. But health officials may not know how dangerous the virus is until more cases are found. "It's still (in the) very early days," a WHO spokesman told the AP. "At the moment, we have two sporadic cases and there are still a lot of holes to be filled in."